SPECTACULAR SPIDER-MAN #132 INTERIOR PAGE 4 Media Type: Pencil and Ink Art Type: Interior Page Artist(s): Mike Zeck (pencils) Bob McLeod (inks) WOW! The most HISTORIC story to EVER come out during the decade of the 1980's for Marvel Comics was the CLASSIC 6 part storyline aptly titled: Kraven's Last Hunt! The original artwork to this ENTIRE 6 issue storyline had been in private collections ever since it was drawn back in 1987, until I acquired and put up Parts 2 and 3 in March of this year. This Kraven's Last Hunt Part 6 of 6 titled Ascending! Features more Spiderman, and more Spider-man battle pages than ANY of the previous 5 parts to Kraven's Last Hunt storyline! So don't miss out on this INCREDIBLE opportunity to get a GREAT page from this MONUMENTAL 23 year old storyline, which will be a GREAT addition to your collection, and will be a "CLASSIC" for DECADES TO COME! This GREAT page 4 features Spider-man throughout, as he fights Vermin's rats in the sewers! Please find out more about me and my other items here. 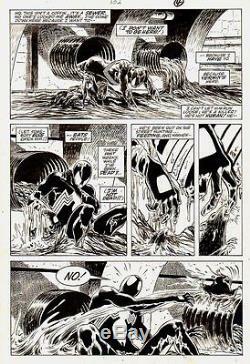 The item "Zeck, Mike SPECTACULAR SPIDER-MAN 132 PG 4 Original Art KRAVEN'S LAST HUNT PT 6" is in sale since Monday, May 12, 2014. This item is in the category "Collectibles\Comics\Original Comic Art\Interior Pages". The seller is "romitaman" and is located in Ravenna, Ohio. This item can be shipped worldwide.